I always love to find secret restaurants. The ones that are out-of-the-way quaint places and you have to find it like having a treasure map with X marking the spot. I also want to surprise my wife every time with these few secret places that’s becoming rare these days. I always love it when you really have to drive and maneuover your way through the city maze not knowing exactly where the place is. My wife would start to sermon on how expensive gasoline is but I just had to satisfy my thrill of looking for these places specially if the only clue I have was “it is just along shaw boulevard.” Even though we traversed the entire shaw boulevard, we cannot find Cook book kitchen and it is just a stroke of luck when we just happen to pass by the place when we are becoming desperate. The place is cozy and you can count the table by your fingers. It can sit a maximum of 40 people where you can reserve this entire place for a private function of yours. Home made cream of squash soup (P80) which is a light version and not the usual thick based soup. I like the way the sour cream overpowers the taste of the squash. Parmesan Crusted White Fish (P 230). Rich, Succulent, and baked! This is THE best seller of the house and my wife and I agrees 🙂 The tender fish is coated with parmesan and Kraft mayonnaise with a blend of italian herbs baked in olive oil. Yummy! This is definitely good for two and we find ourselves scooping the last piece of sauce remaining on the plate. The only downside is, you have to break your diet for this one. As with any homemade goodness, sometimes you prioritize superior taste over the consideration of fattening ingredients. Pork Steak with Honey Mustard Sauce (P220). Grilled Pork Steak in light soy with rosemary and spices served with honey mustard sauce. The meat is tender and has been marinated pretty well. I think the secret in this dish is the honey mustard sauce. Kittin’s Scarlet Cake (P120). This is a specially made red cake (you cannot find anywhere) by Chef Christine “Kitting” Constantino – Zenarosa. She is a culinary management graduate of the Daytona Beach College and of the Culinary Institute of America with a 2-year stint in an LA restaurant. Frankly, nothing special, and all I can remember is the sweet calorie-filled icing that dominates the rest of the cake and its price. Gen and Eliza Capati, owners of Cookbook Kitchen. Let me know what you think about cookbook kitchen. It seems that not a lot of people have been to this place and it is just starting to be discovered by some foodies. Directions: If you are coming from Shaw from the Edsa end, you have to turn right on Torres St along Shaw Blvd before reaching 9 de Febrero. Turn left in Araullo treat and left again immediately in the Socorro Fernandez st. If you are coming from Greenhills, It is a lot easier since you just need to pass P. Guevarra st. in Wilson towards Shaw Blvd along the Luna Mencias st. Turn left to Socorro Fernandez st and you will not miss it. Latasia Fusion – Vegetarian Food that is making a difference! Chocolate Kiss Cafe – The Good Stuff? Actually it doesn’t seem expensive to me at all. There aren’t many places nowadays (except for soms) where you get good value for your money. If you want good food with good service, you do have to shell out extra money for it. Thanks for this review, like I’ve mentioned before I always took this place for granted because it’s right across my sisters house. But we’ve been meaning to try it out. I’ll send this to her so maybe it’ll entice her even more. I’ve been meaning to try this place out for almost a year! I’m glad you wrote about it, Anton. Had dinner in CBK tonight and I have to say, it was a super wonderful experience! I went with my cousin, my sister , her husband and their 4 kids. Everyone loved it. From the very friendly and accomodating Christy, to the delicious main courses, the charming mismatched table cloths, the cozy feeling of really being in a kitchen, and best of all the desserts! Oh my god the desserts. That scarlet cake was my favorite (this is more commonly known as red velvet cake), I loved the cream cheese frosting on it. We had practically every dessert on the menu except the pineapple upside down cake: strawberry shortcake overload, decadent chocolate rum cake, the yummy lemon poppy seed cake. YUM! And I thought it was all so cheap considering what we ordered. I forgot to add: just to show you how extremely great this place is and how nice they are, I casually mentioned to Christy how it would be nice if the Pork Steak with Honey Mustard Sauce had a chicken version (reminiscent of one of my favorite dishes the Alice Springs Chicken), and she offered to make it with chicken instead. Now how many restaurants would do that, or have staff who would even offer to do that? WOW Christine, coming from a foodie like you I think cookbook really satisfied you completely. This is a good testimonial and I do hope more people can get they same kind of dining experience. Thanks for the tip on the chicken version. I was wondering about that instead of ordering the pork version… I do agree with you that not a lot of restaurants would go out of their way to change the menu based on your preference. After a couple of badminton games, we headed to CBK. Yep, the food was great and we tried some of Anton’s picks and more! We even had showbiz sightings… Bianca Gonzalez, Drew Arellano and Mariel Rodriguez… hehehe! Thanks, Anton, for introducing CBK! this is gen and liza of the cookbook kitchen. Thank you for the write-up. It has gathered much response. God Bless You,Anton. I sought out this restaurant after reading this thread and I agree that it is a good find. The food is good, the ambiance is subdued and the service is warm and hospitable. Will definitely recommend. Hi! I just happened to pass by your site and your food and resto features sure looks tempting! Thanks! Thank you for being a Cookbook enthusiast. Hope to meet you someday! this is featured in this month’s issue of cosmo (cosmo dining section). thanks for the review. will definitely try this one. this place is definately a winner!!! really great food! i’ve never been disappointed since i first visited the cookbook! the mural on the wall is actually a reproduction of Van Gogh’s “Cafe Terrace at Night” (1888). I had two opportunities to eat at CookBook Kitchen before i moved to the U.S. for good early last year. It was my former work colleague (who loves eating at secret “hole in a wall” places like me), who suggested that we go there for dinner as sort of despedida for me because his friend had been there previously and was raving about it. Together with another colleague, the three of us went there on a weeknight. We were not disappointed. The food’s divine! We ordered the highly recommended dishes by the food server….I especially love the parmesan crusted baked fish. We had the place to ourselves, ideal for an intimate date, actually. I had to come back again the following week, this time with my college friends and ordered the same fish dish as I couldn’t get enough of it (despite being high in cholesterol). I knew even then that the place will not remain a secret too long because just by word of mouth alone, people would flock to experience a gastronomic journey. So as not to miss Manila too much, i would try replicating dishes of restos I have been to in Manila..dishes that have become my favorites, including that of the parmesan crusted baked fish….this time i used Tilapia fillet. I had my family and friends sample it and the serving plate was empty too soon…that’s when I knew I hit the jackpot! So this dish has become a staple in gatherings. I will definitely include CookBook in my dining itinerary when I visit Manila next year with my American husband. I want him to experience as well an unforgettable gastronomic journey. This and other new “secret” places :o)…courtesy of Anton’s blog site. My husband and i just tried eating at Cookbook Kitchen last night for the first time after hearing about it for quite awhile now. Since i heard that people were raving about their parmesan crusted white fish and pork steak with honey mustard sauce, that is what we ordered. In my own, honest and humble opinion, i was quite disappointed with both dishes. The fish was sort of undercooked or underbaked for that matter and the pork steak was just so-so. They already increased their prices which i understand considering that prices really are increasing here and there. Maybe because the place was jampacked with diners that the consistency of the dishes were somewhat overlooked already. Another comment i have was the ultra & almost-chokingly fast service. Seems weird that i commented on fast service when i know that most would complain if their food comes out so slow, but in our case, it was just so fast to the point that we could not enjoy our food anymore. We were just in our 5th spoonful of squash soup when our entrees arrived. The waitress literally lifted our squash soups and placed it at the center of the table in order for her to be able to put down our main course in front of us. We kinda felt pressured and hurried. We ended up trying to scoop as fast as we can our squash soup in order for our entrees not to turn cold. We couldn’t start with our fish and pork steak either as our soup can likewise get cold. That definitely wasn’t an enjoyable moment. Maybe they were plagued with slowness complaints before that’s why they went extreme on us. Sayang talaga! But i give my two thumbs-up to their mango cobbler and red iced tea, yummy! It was my frist time to try out the food in cookbook kitchen this afternoon and all I can say is thank you Anton.. hehe.. It was just too sweet but I have grown to love that cake. so unique to CBK. 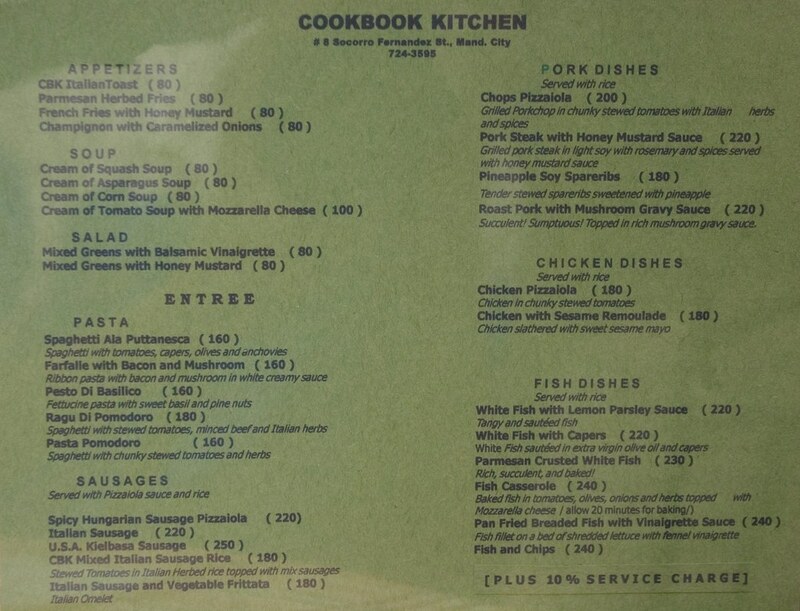 would you know the way to this cookbook kitchen coming from the makati/mandaluyong bridge? Aya, from Makati Mandaluyong Bridge, you have to go to the Mandaluyong Circle then turn right into Nueve de Pebrero. Go straight in this road until you cross shaw. Turn right on the next major intersection where most of the cars are turning. When you see Keys elementary school on your right, turn right on the road and then turn on the first left where Explorations is. You should see CBK after Explorations. How could you like the Parmesan crusted fish? All I can taste was oil.. 🙁 The price didn’t seem to match the taste. 🙁 Or maybe it was a bad day.. I hope they’d change their menu to include VAT. The law mandates restaurant and retail owners to include VAT in the menu/price list. Had dinner at CBK today. We had purple soup, wasabi soy fish, Adobo Pasta, Kittin’s Scarlet Cake, Green and Red Ice Tea and Coffee…The taste was good but not sure if Dory fish is a good choice. Recently got an email circulating that Dory fish is not good for one’s health. Since then, am not a fan of this fish. Can this be change to Maya Maya fish instead? I like the purple soup, Green Ice Tea, Adobo Pasta and Kittin’s Scarlet Cake. Our bill was almost P1000 for 2 persons so about P500/pax.